Submitted by tecmarin2 on Sun, 09/04/2016 - 17:31. Submitted by mikechuks007 on Mon, 09/05/2016 - 07:52. Is this happening on the free or paid version? Submitted by tecmarin2 on Wed, 09/14/2016 - 15:51. Submitted by mikechuks007 on Thu, 09/15/2016 - 08:03. Submitted by besomar on Thu, 07/09/2015 - 06:38.
i have noticed that loger SMS are truncated. I am using e-mail forwarding. Also there is some calls that are not forwarded. Submitted by deepbluesnow on Sun, 05/17/2015 - 10:55.
follow the instructions... maybe you need to update the app? Submitted by nadunpeushan on Thu, 01/22/2015 - 06:48. I was using the app perfectly. but suddenly I had to format the phone & re-install the software. then I again installed Total SMS Control correctly & configured. but now only sms & call notifications are forwarding. 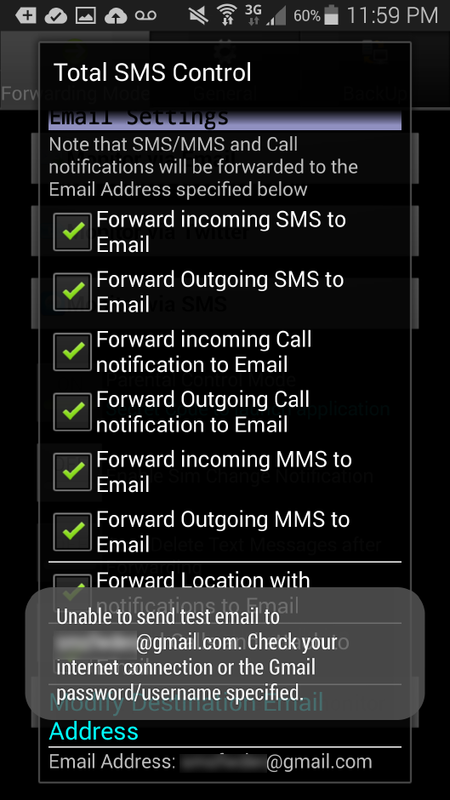 background sound sms command also working but when I check the phone folder SCbackup, no recordings have been saved. Please advice to rectify the issue. Submitted by mrcaptainawesome on Wed, 10/29/2014 - 00:13. Unable to send test email to ****@gmail.com. Check your internet connection or the Gmail password/username specified. Submitted by nadunpeushan on Sun, 06/15/2014 - 23:31. I have set the remote voice recording via sms command. But I am unable to find the location where the recorded file has been saved.. I checked everywhere in the phone gallery , file explore etc.. Submitted by agiru on Thu, 04/19/2012 - 02:10. Submitted by Itiswatitis99 on Tue, 06/19/2012 - 16:38. Submitted by toofast4luvxxx on Thu, 06/07/2012 - 01:28. Yeah I have the same issue of not receiving outgoing activity with this app. Among others such as target device develops many glitches. Black screens, freezes, oh and the newest one, and my personal favorite randomly sends text messages after rebooting device its always at odd times of the morning 2 or 3am. All and all this app is ok. It could be so much better though. Submitted by jhype4245 on Mon, 04/09/2012 - 23:52. Submitted by jhype4245 on Mon, 04/09/2012 - 23:34. Submitted by mikechuks007 on Tue, 04/10/2012 - 01:20. The instructions are in the licensing app you just downloaded from SlideME. Submitted by rekcahlive on Mon, 02/27/2012 - 14:03. Hi I have bought the sms storage app I think that's its name @ $4.99 which is a fantastic app by the way thanks for making it. But I am wondering what the difference is with the total sms control spy app @ $29.99 am I right in thinking that this app can be deployed or remotely installed I would like to buy it if this is the case but I don't wanna spend nearly 30 bucks to find out that this isn't the case any help would be much appreciated thanks very much. Submitted by mikechuks007 on Mon, 02/27/2012 - 15:35. Thank you using Total SMS Control. The 29.99 USD version cannot be installed remotely. You will need about 5 mins access to the target device you which to monitor in other to install the main app which will be gotten from the License manager app called Total SMS Control -SPY. The 29.99 USD is completely hidden on the device and does not require SlideME market to be installed on the target device.